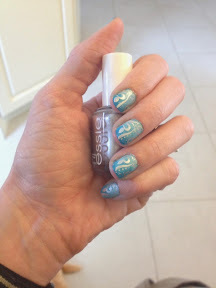 I started off with a nice light blue, Sally-Hansen's Blue-Away and then sponged on a darker blue (Blue Me Away) on the tips for a gradient look. 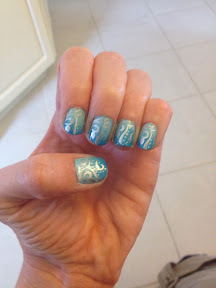 I pulled out my stamping nail art kit from Konad and my Konad stamping plate m64 and stamped with some Essie (No Place like Chrome) over my gradient blue polish. On a completely different note but just as fun, my pack of warm greys Spectrum Noir markers arrived... At last...lol I ordered them back in June and for some reason they took a really long time to come in. I have been upgrading my markers to the second generation markers when enough of the markers from one colour family runs out. Instead of buying the ink refills I have been buying the packs of second generation markers instead. I have not had as much time at my craft table as I would like but I've had a chance to play today!! Watching this weeks "Make it Monday" challenge I knew exactly what I wanted to do!! I pulled out one of my favourite stamp set, Green Meadows from Papertrey Ink, some water colour paper and distress inks and had a lot of fun creating this card!! I have been thinking of what other word dies are available so I can keep on using my kit for other kinds of cards. I have found some really pretty "love", "thanks" and "hello" dies that I am thinking of ordering. I have also found that you can buy some acetate paper (clear paper) at Staples from their copy desk for $1 each. The quality is not as good but I can buy it locally and it looks nice, you really have to look hard or know what to look for to notice a difference.